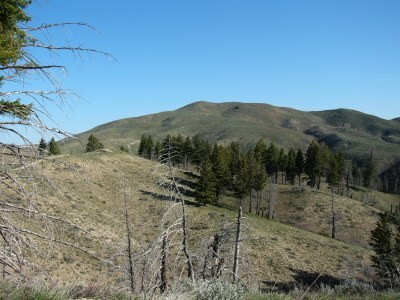 Kepros Mountain is located in the Danskin Mountains, in the Boise National Forest, just southwest of Arrowrock Reservoir. This peak is one of the four peaks of the Grand Slam Peaks, the other three peaks are Mount Heinen, Cervidae Peak, and Shaw Mountain. Kepros’ summit is reached via a long, enjoyable ridge walk. 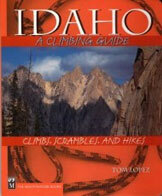 This is a great out and back hike, with a little over 1,700-feet elevation gain over roughly 10 miles. As a bonus, you can ascend Peak 5380 along the way without much detour. Like all Grand Slam Peaks, it’s a popular weekend ascent during the spring. Kepros can be a long, hot ascent in the summer. In fall, the peak and area around it is heavily used by hunters and should be avoided. Kepros Mountain is also is doable in winter, with appropriate gear and winter climbing skills. This photo was taken from Heinen Peak and shows the long ridge that the route follows from Three Point Mountain to Kepros. Caution: This entire hike is on or near exposed ridge tops. Don’t hike this area when thunderstorms are present. Watch for rattlesnakes. There is little shade and no water along the route. From I-84 use Exit 64 east of Boise. From the exit, take the well-paved road north through rolling hill country. Keep left at the only paved fork (which has signs for stores in Prairie, Idaho). Continue on this road, which soon turns to gravel, to Black Creek Pass, 9 miles from the freeway. A large parking area is located on the east side of the pass, and the trail starts on the west side. The start of the trail on Blacks Creek Pass. 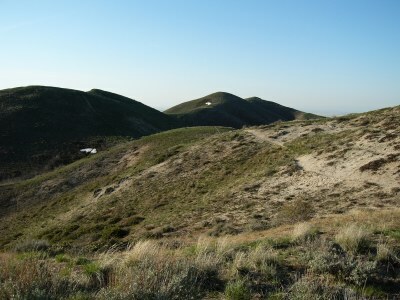 The climb uses a combination of an unofficial trail and a 4WD road. The road is only open during hunting season. 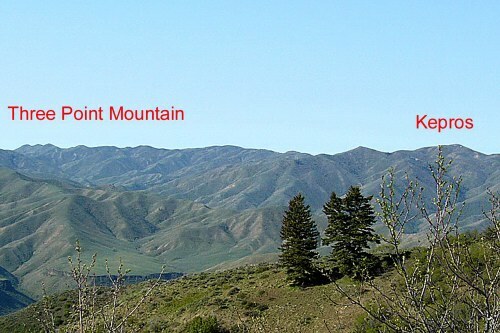 In 1990 when I first hiked to the summit, I used a motorcycle track that climbed from the Blacks Creek Pass to the ridge top north of Three Point Mountain and then followed the ridge line north to Peak 5380 where it joined the 4WD road. Since then, the Forest Service has closed the route to motorized travel and this route became an official hiking trail. This is truly a spectacular hiking route. Over subsequent ascents, I marked several bypasses along the west side of the ridge with rock cairns. 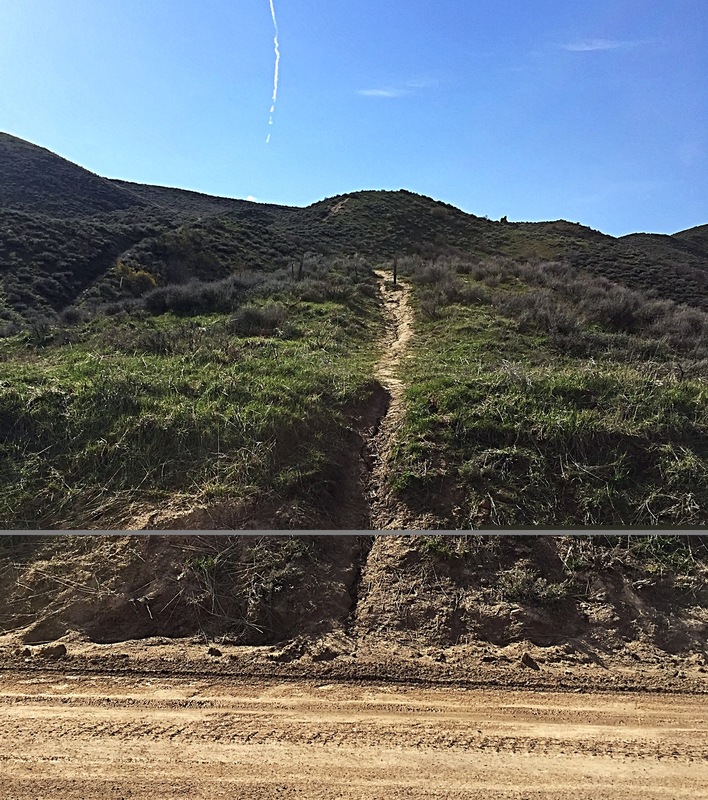 These bypasses avoid following the ridge top and reduce the elevation gains and losses of the original trail. The bypasses (with the exception of the first one) are now well established routes. Today, starting from Blacks Creek Pass, the hike climbs steeply west on a rutted trail, which is slippery when wet. After two steep sections, the trail passes by a small grove of stunted trees. if you feel comfortable with your directional abilities, you can follow the bypass route, which is marked by several cairns and fully described below. The first bypass saves you a couple hundred feet of elevation gain. The first part does not have a pronounced tread to follow. To follow the first bypass, turn right off the main trail just after the stunted trees. There may or may not be a cairn visible at this point. This bypass is roughly 150 yards long and crosses a side hill to a flat ridge top with a small rock outcrop. 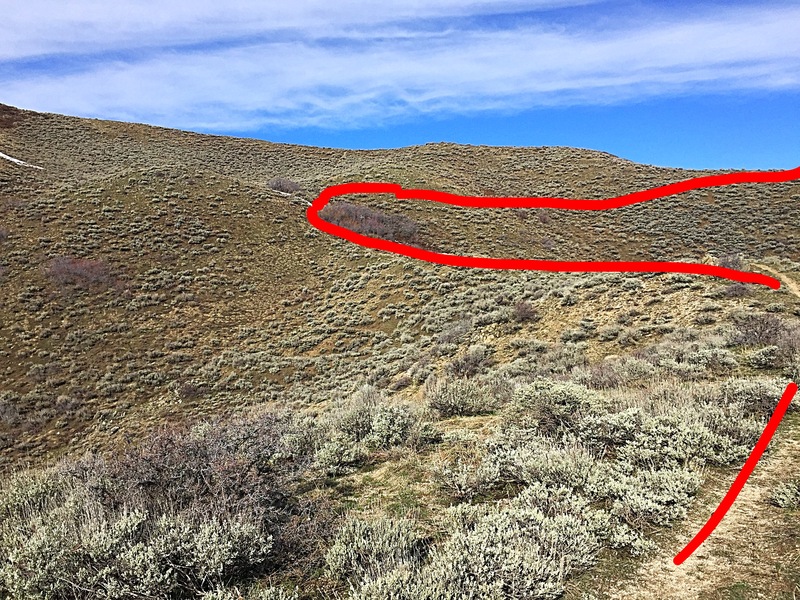 From this point, drop down to the west and find the trail tread that leads toward the major saddle on the main ridge north of Three Point Mountain. 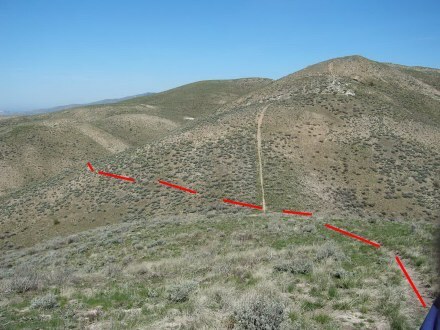 The red line shows the trail leading up to the grove of trees, and then the bypass leads across the ridge. 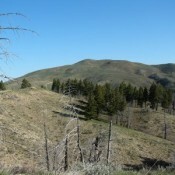 This photo was taken from the north ridge of Three Point Mountain looking north toward the first saddle. As you reach this saddle, you will encounter a 5-way intersection. 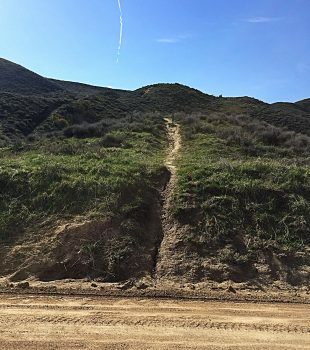 The trail on your right comes up from the east. The trail you cross is the old ridge line motorcycle track. Continue straight ahead, which is the second bypass. The second bypass has a good tread for its entire distance, but is a bit brushy in spots. It is also the flattest section of the climb. As the bypass nears the point where it rejoins the ridge, it climbs up a steeper slope and gains roughly 75 feet of elevation. 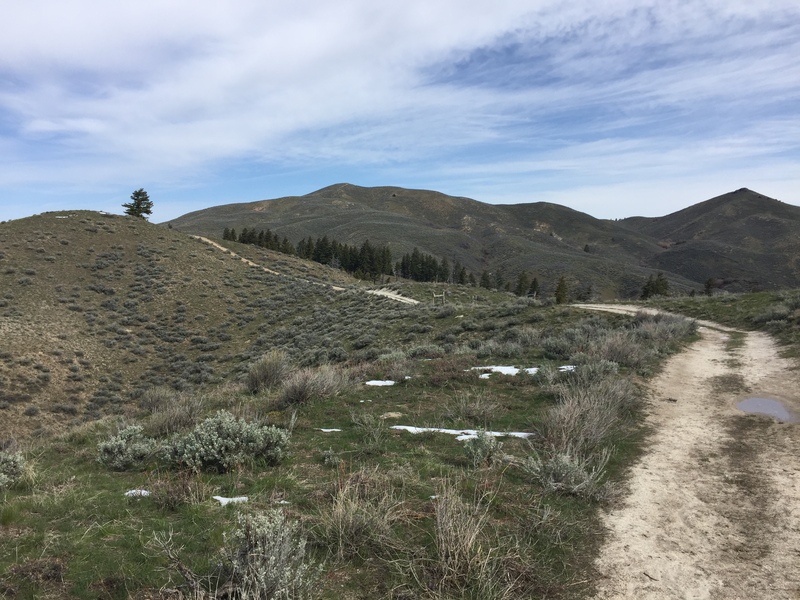 Once you reach the ridge top, take a hard left onto the old motorcycle track, which quickly climbs a sandy hill side and then turns north to follow the rolling ridge line until it drops into the next major saddle. The route follows the ridge north. The third bypass leaves this saddle and runs west (or left) around the west side of the ridge. This is the longest bypass and it goes in and out of small drainages and crosses two tiny saddles. The tread is good, but you will encounter some brushy spots to navigate. The third bypass joins the ridge top and the old motorcycle track just east of Peak 5380. Soon after starting the climb to the top of Peak 5380, the trail forks. The right hand fork is the beginning of the fourth bypass. The fourth bypass runs around the east and north sides of Peak 5380. 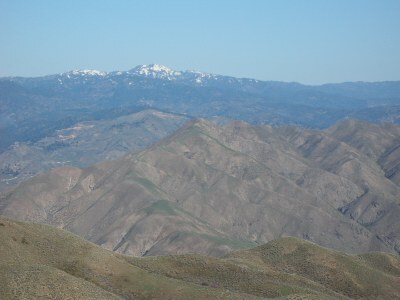 Mores Mountain and the Bogus Basin area to the west. If you want to climb Peak 5380, continue straight up the hill and meet the 4WD road that runs north and eventually leads all the way to the summit of Kepros Mountain. If you want to skip Peak 5380, take the fourth bypass, which has a very good tread and is fairly level. This bypass joins the road north of Peak 5380. Once you are north of Peak 5380, you are on the home stretch, but you still have a long way to go. From the north side of Peak 5380, the road descends over 600 feet to the lowest point (roughly 4,700 feet) between Peak 5380 and Kepros. From the low point, the summit is roughly 1.25 miles away with 800 feet of elevation gain. The easiest route is to stay on the road, but there is also a fifth bypass you can use. The fifth bypass starts just past the fence line shown in this photo. 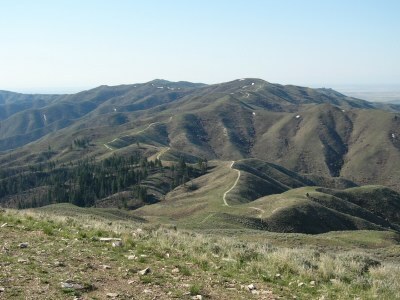 This is also the lowest point between Peak 5380 and Kepros Mountain, which is the high point left of center. The fifth, and final, bypass leaves the road just after it passes through a fence line that crosses the ridge at its lowest point. This last bypass saves some elevation gain but is a little longer route than following the road. This bypass has a good trail tread and eventually joins up with the road at the base of the last, steep climb. Then just follow the road to the summit! The summit of Kepros Mountain in the distance. Looking back down the route from the summit of Kepros Mountain. Peak 5380 is just right of center, and Three Point Mountain is left of center. 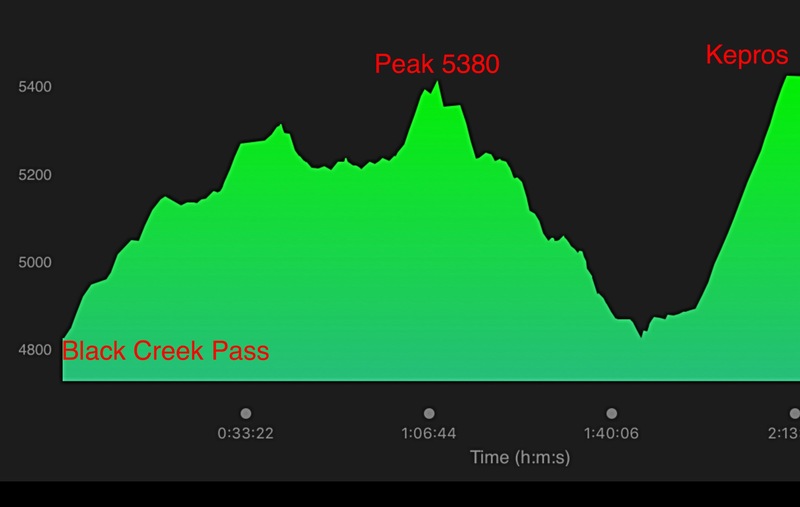 Elevation profile going over Peak 5380. 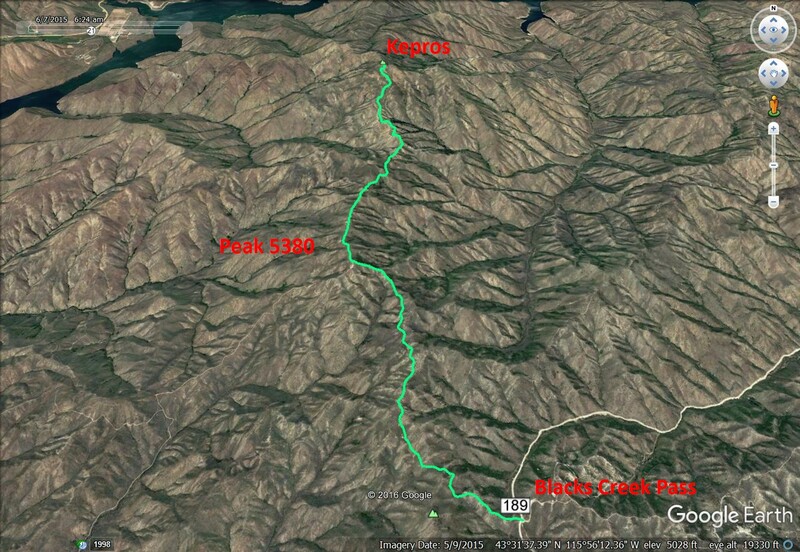 My GPS recorded 5.1 miles with 1,516 feet of gain and 925 feet of loss from the start to Kepros. On the return, the GPS recorded 755 feet of gain and 1,339 feet of loss over 5 miles. From the summit, you can reverse the bypass trail or follow the ridgeline all the way down, or combine the two options.